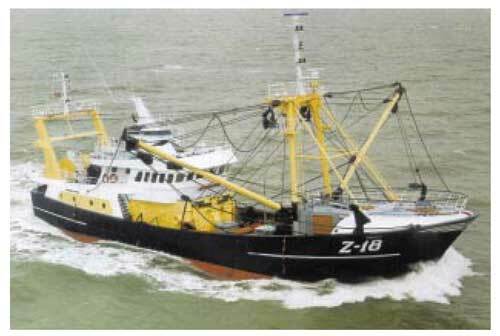 In 1974, the year preceding the allocation of quotas, the Dutch demersal North Sea fishery (in the Netherlands known as `kottervisserij' = cutter fishery) was carried out by a fleet of 610 vessels (Smit et al. 1995), mostly owned by single-vessel family companies, but in a number of cases by firms owning two to four vessels, but still family companies. The vessels varied much in size and in the combinations of gear used. Figure 1 gives an insight into the development of the demersal fleet from 1965 to 1975. The 1975 figures are added because fleet structure in that year was still more influenced by investment and replacement decisions taken earlier, than by the quota system. The investment boom just prior to, and during, the introduction of quotas is clear, not in terms of numbers of vessels, but in terms of total engine power. In 1975 this power exceeded two times the level of 1965. Noteworthy is the increase in employment, being in line with the number of vessels, but not with total engine-power: although bigger vessels have larger crews than the smaller ones, it meant that the average number of crew for each vessel-type tended to decrease. Figure 2 shows the development of the composition of the fleet. The shift to ever-bigger vessels, leading to the increase of total engine power, continued throughout the whole period. The development of landings is shown in Figure 3. The dominant position of the two flatfish species, sole and plaice, is clear. Landings of plaice (Pleuronectes platessus) increased, while those of sole (Solea solea) declined after the effect of the large 1963-year class faded out. Landings of Cod (Gadus morhua) showed a boom in the early seventies, but have decreased since. The change in ex-vessel gross proceeds (deflated to the money value of 1974) is shown in Figure 4. In terms of value the dominant position of flatfish was even larger than in terms of quantities, thanks to the high price received for sole. Total real proceeds increased up to 1973, but then tended downwards as a result of lower prices, clearly the result of the economic slump caused by the 1973 fuel crisis. Table 1 gives information on the fleet in 1974, alongside information on fishing activities by the main gear types, expressed in HP-days. Double-beam flatfish trawling was by far the most important activity, especially for the bigger vessels. The medium-sized vessels were also trawling on roundfish (otter and pair trawl) and the smaller ones on shrimp (Crangon crangon) (double beam trawl). Herring pair trawling was a seasonal occupation of some, mostly bigger, vessels. There was a mix of gear types used especially within the groups of smaller and medium-sized vessels. Not only different vessels used different gear, but in many cases vessels used more than one type of gear alternatively. Apart from the directives on herring (Clupea harengus) landings up to 1974 in the North Sea by the North East Atlantic Fisheries Conference (NEAFC) no active fisheries management for the Dutch fleet in terms of restricting fishing effort or output existed. Only technical measures like minimum mesh size and minimum landing size existed up to that year. Beginning in 1975 within the framework of the NEAFC, the North Sea demersal fisheries started to undergo stricter management measures. The countries concerned agreed on total TACs and national quotas. As far as the member states of the European Economic Community (EEC), and thus the Dutch fishing sector, are concerned, in 1976 responsibility for fisheries policy and management was taken over by the European Commission. Ultimately, the fisheries were governed under the umbrella of the Common Fisheries Policy (CFP 1983). The CFP still is the framework for fisheries management by the European Union (EU), which suceeded the EEC. The allocation of national quota in the framework of the NEAFC led to national measures to ensure that national fleets met those quota in 1975 and onwards. In the Netherlands, management was first focused on flatfish. One reason for this was the predominant position of flatfish fishing in the North Sea of this country. Another was the feeling that the flatfish stocks badly needed management. Source: Agricultural Economics Research Institute LEI, Fisheries Division. The two flatfish species to be managed were sole and plaice. In 1975 the government (Fisheries Directorate of the Ministry of Agriculture and Fisheries - MAF) had only some general directives. Lengthy consulting rounds between the MAF, organisations in the fishing industry and research institutes (Netherlands Institute for Fishery Research - RIVO, and the Fisheries Division of the Agricultural Economics Research Institute - LEI) resulted in a management system from 1 April 1976 onwards. The decision was to manage the flatfish fishery by vessel quota for sole and plaice. These flatfish species were the main target species of the twin-beam trawler fleet. This fleet was the biggest sector of the North Sea demersal fleet, which also included roundfish (pair) trawling, shrimp (Crangon) trawling and herring pair trawling. Many vessels were exploiting two or more of these fisheries. Other species for which the NEAFC had decided to establish quota (herring, and roundfish species like cod and whiting (Micromesistius poutassou)) were not included in the quota system by the Netherlands for the time being, as the government expected that those, relatively minor, landings would not distort the system too badly. Also problems arising from the multi-species character of these fisheries (e.g. many vessels participating in two or more types of fishery, the bycatches, etc.) prevented them having a complete system for all species ready from the beginning of the implementation of a quota system. To be sure, over the course of the years management developed for these species also, culminating in individual quota as well. This case study deals with the allocation system for individual quota of sole and plaice. To illustrate the impact of the measures, it should be noted that the level of the quotas (at least for a period of nine months) extended to only 42% of the highest landings of sole during one of the (reference) years 1972, 1973 and 1974, and 54% of the highest landings of plaice. Initially IQs could not be sold, leased, or used as collateral, etc. One reason for this was that quota transfers would cause extra management problems; another was the fear that quotas would be concentrated in an undesirable way. Nevertheless "unofficial" transfers of IQs developed rapidly, for instance by transfer of vessels including their IQs to other enterprises, by merging or splitting of enterprises and by individuals switching from the one firm to the other, taking IQs with them. Gradually the management followed practice, and trade in IQs became ever more official. Nowadays there is an official system of IQ trade including a central clearing institution. This system is managed by a co-management framework (Smit et al. 1996) with a high degree of self-responsibility for the industry, organised in "groups" of fishing firms. Fishermen in these groups pool the use of their individual harvesting rights (ITQs and days-at-sea). The group board controls transfers of ITQs (and the accessory days-at-sea) between members on a permanent basis (buying/selling), or on a one-year basis (leasing), using agreed transfer prices. In some cases even the ownership of some quotas has been assumed by the group boards. The system works so well in terms of ITQs that the common view is that the effort regulations (maximum days-at-sea), introduced around 1987 as an auxiliary measure, do not play a significant role anymore. It must be stressed that this management system took many years of development, the "group" system only having been established in 1992. The main objective was a political one: to get the fleet to adhere to the internationally agreed national quota, with the least pain and sorrow. This objective was not extended to the management of fish stocks themselves, since this was done on the international level. So the basis of national policy objectives was only the national quotas resulting from that management. No objectives concerning fleet size or structure were pursued by the IQ system initially. As the Director of Fisheries of the MAF put it at that time: "It is the fishermens' decision to fish the quota by a Mercedes or a Citroen 2CV. As long as they obey the quota rules that is no concern of the government". Another (sub)objective was to further as much as possible an even spread of landings over the course of the year. This objective was of an economic nature, to ensure an optimal price for the catches taken. Major problems in getting the industry to adhere to the quota, as fleet capacity was too large for the available quota. Uneasiness with regard to the economic future of the fleet, in view of the discrepancy between quotas and fishing capacity (and costs). Already in 1975 the government tried to limit fishing capacity unilaterally through the use of scrapping-premiums. But, after an initial fleet reduction, and in the absence of any form of licensing system, the initial quota system did not prevent the fleet expanding again when fishermen began to circumvent the quota systems. Fishing capacity directives from the EEC Multi-annual Guidance Programmes. A more forceful CFP management regime has developed since 1983 under the EU, and a set of other objectives were formulated, especially in terms of fishing capacity and fishing effort. Management instruments like engine power (HP) licences and maximum days-at-sea permits were introduced. These instruments served to meet the new objectives, but were also thought to strengthen quota management since it appeared difficult to adjust landings in line with quotas using only ITQs. The original IQ-management left too many loopholes for the fishermen to exploit (e.g. misreporting and direct sales to merchants, thus avoiding the administrative controls in place at the fish auctions). It was recognised in an early stage that a total sector quota, even split by periods within the year, was not an optimal economic solution. Obviously, such a system would not prevent a "race for fish" and thus excessive competition. This was clear to both the government (MAF) and the fisheries organisations, centralised in Public Sector Organisations (either horizontally integrated, e.g. the Board of Fisheries - Visserijschap, or vertically integrated, e.g. the Dutch Fish Board - Produktschap Vis), both existing on the basis of a national law on Public Industry Organisations. So those involved - the various shareholders - came to think of individual harvesting rights. Creation of harvesting rights by managing individual fishing capacity and fishing effort were contemplated, but abandoned. In the first place there was insufficient information on the relationship between effort and landings, especially with regard of the recent investments in big vessels. Subsequently, research by LEI indeed revealed that engine power simply measured in HPs did not provide a reliable measure of fishing capacity, nor did HP-days represent fishing effort accurately. Fishing capacity in terms of horsepower clearly decreased when vessels were bigger, thus distorting any time-series on fishing effort when vessels were replaced by bigger ones, and, it might then be a problem to monitor innovations and other means of increasing vessel efficiency. In the second place such management would not guarantee that (multi-species) fishing would reflect the quota allocated by individual species. It was feared that landings of certain species would then be closed prematurely, probably resulting in fish being thrown overboard or landed in "black" or "grey" markets. Ultimately, MAF and the industry agreed on an individual quota management programme for sole and plaice. It must be kept in mind that the time for preparation of the programme was rather short. No one had thought intensively about organising a management system prior to the announcement in 1974 of quotas by NEAFC for the coming years. And, at that time, the government and industry were advised by the Fisheries Division of the LEI. After a provisional sector regulation in 1975, for each vessel active on 1 January 1976 and having a recent history of flatfish fishing, individual quota for sole and plaice were allocated. The National Fisheries Statistics (see Section 4) for 1972, 1973 and 1974 were used to calculate "track-records" by species per vessel. Each vessel was `awarded' as its track-record the highest landings of sole and plaice that it had achieved during one of those reference years. But then many problems started to become apparent. A large number of enterprises had replaced their vessel(s) in these years. That was not only the case for fishing firms investing in new vessels, but also for the buyers of second-hand vessels. The investment in a new vessel frequently triggered a chain of replacements in two to four firms. Track-records for the old vessels (in nearly all cases smaller than the new one) needed somehow to be corrected to give a reasonable track-record for the new vessel. Not only do bigger vessels have a larger fishing capacity, but in many cases the types of gear used and/or the composition of landings for the new vessel might differ from that of the vessel replaced. Also, the system needed to provide for enterprises which did not have a vessel sailing on 1 January 1976, for instance when an old vessel was already sold but the new one was not yet operational. There was a comparable problem in those cases where vessels were laid up for some time during the reference period (because of engine trouble, etc.). To resolve those difficulties it was agreed that in all cases of vessel change, where the replacment vessel was brought into service, or ordered, before 1 January 1975, there would be consideration and a correction because fishermen were allowed to choose which of the three reference years would be taken as the basis period: some investors could use a reference year in which the new vessel was already sailing. For cases in which the replacement date would not allow for a full year's fishing with the new vessel a theoretical track-record was to be calculated. To that end the relationship between engine power and the landings of sole and plaice in the reference years was derived by the LEI from data in the National Fisheries Statistics, to arrive at a sufficient correlation level. It should be acknowledged that for the newest generation of big vessels the data were extrapolated (rather conservatively) in order to obtain the relationship. On this basis "problem vessels" were awarded theoretical track-records. However, they were still allowed to use a "real" track-record on the basis of one of the reference years if they so wished. Some owners who had changed their vessels complained that one should account for their fishing results being better than the average in their HP-class during the reference period. They wanted their "average" theoretical track-record to be corrected, but of course, no complaints were heard from vessels that had fished below the fleet average! To resolve this problem the system applied to vessel changes was altered: in 1977 steps were taken to allow for a mix of real and theoretical track-records. Ultimately the track-records were based on 50% of real historical landings and 50% on the theoretical landings. This system of allocation is still used today. Initially the Dutch Fish Board was to manage this system, but the Board could not satisfactorily administer the programme because of its limited management capacity, and also because too many interest groups were represented on the Board, which might lead to a clash of interests. In addition, the availability of accurate data on individual vessels' landings to a non-government organisation seems to have been a problem. Thus after a short period the Dutch Fish Board returned the responsibility for the system's management to the government. The last step was to distribute the total available national quota of sole and plaice among all track-record holders, in proportion to their track-records. To that end a change of the National Fisheries Law (NFL) was presented by the government and then passed by Parliament. In the framework of this new Law the MAF could impose quota regulations on the sector. The vessel owners were informed by the MAF of their quota for the coming year by letter. Unfortunately, because of several years delay in the decision-making process at the EEC/EU level and the following rounds of calculations by the MAF, the letters arrived long after the beginning of the new year. This caused extra uncertainity as to the final decisions on IQ amounts in the course of the fishing current year, and lead to some complaints and appeals. Incidentally, a small part (1 to 3%) of the national quota was not divided, but kept aside as a "national reserve" to cover any cases of fishermen exceeding their quotas. For a long time the MAF and the Central Bureau of Statistics (CBS, Ministry of Economic Affairs) had already been co-operating to keep a system of detailed statistics on landings. The MAF organised the initial data to be sent to the CBS who put them in a landings statistical system. Among other things this system could furnish data on landings per vessel by species. These data were seen as being very reliable. All fishing firms were compulsory members of the Dutch Fish Board which obliged North Sea fishermen to sell their fish through public fish auctions. This system was well controlled. Furthermore, landings statistics were based on a law obliging all auctions to supply a copy of each sale slip to the statistics authority. In each fishing port representatives of both the MAF and the Dutch Fish Board supervised the procedure to ensure that it functioned correctly. The representative of the Dutch Fish Board supervised the "auction duty" and the MAF representative was responsible for all sale slips to be sent to the CBS. For research purposes the MAF representative also added data such as trip-length, fishing time and fishing area, which were obtained through regular inquiries. Total landings of all vessels were then checked against the aggregated landings figures that were published by the auctions. It should be noted that the obligation by the Dutch Fish Board to land at fish auctions officially ceased after 1970. The reason was that it was not compatible with EEC market regulations. But the long tradition in landing fish at auctions did not change and practically all fishermen continued this way of selling their fish during the period 1971-1974. Therefore, the data in the national landings statistics were felt to provide a solid basis for fisheries management. Also, the overwhelming part of the industry saw no problems in the process. Only after the establishment of IQ systems did fishermen began to make use of the absence of the auction obligation to circumvent the system, for instance, by direct sales to merchants and processors. This incidentally severely hampered the reliability of the (still auction-based) statistics. While the MAF was one of the owners of the data they were directly available for use. For research purposes LEI also had access to these data. All data were already computerised at that time so that calculating (real and theoretical) track-records was easy. As noted, the industry was consulted sufficiently in the process of organising the system and the allocation of IQs. Some initial problems such as correcting track-records when vessels had been replaced could be met by mutual deliberation during the process. Later, an appeals process was created through which complaints from fishermen could be formally dealt with. First, they might appeal to the managing authority and then, to the Director of Fisheries of the MAF. Their ultimate step was an appeal in public courts against decisions of the Director of Fisheries. Some fishing companies started law-suits against the government, generally to contest the basic right of the government to impose the IQ system (Keus 1991). In one case the Dutch court judged that the national system derived its judicial basis from the European Community. So the case was referred to the European Court of Justice, which found the EC to be within its rights (Decision of July 14th 1976). Even when such quantitative measures seemed to be contrary to general principles of free enterprise, free trade and enhancing economic benefits, the importance of ensuring acceptable levels of fish stocks was judged to overrule those principles. The European Court stated that such measures may temporary restrict production, but were taken to ensure increased production (and thus increasing economic benefits) in the future. As a consequence, this meant that the Dutch government was within its rights, and given the rules laid down in the revised Law passed by Parliament (the NFL), the appeals process created within the quota management system was also judged to be legal. The MAF had staff available for organising the quota system and the Fisheries Directorate already had staff working on management schemes such as: minimum mesh sizes, minimum landing sizes, licensing of shrimp fishing, various regulations on inshore fishing and on shell-fish culture. The Statistics Department expanded its manpower while the data were gradually computerised at the CBS. The LEI undertook the required calculations and provided advice. Another factor influenced fishermen in their adherence to their quotas: after the first shock fishermen rapidly began to overfish their quotas and so in order to check this behaviour the services were requested of officers of the Agricultural Inspection Service. Nevertheless after some time even this input needed an increase in the manpower provided by that Service. No extra funding was needed for the allocation process since the system was managed by the standing staff of the MAF, and the LEI was available to undertake research and analyses. Only later was extra effort needed to get the fishermen to observe their quotas, requiring additional funding from the Agricultural Inspection Unit of the MAF. After the initial adjustments the fishermen rapidly found ways to circumvent the IQ system. The MAF managers, having had little experience with the allocation system were not prepared for the reaction by the fishermen, so effective control and punishment lagged behind for a rather long time. Success in achieving the main policy objective was clearly questionable in the early years. Extra measures (such as early closures of the fishery) had to be taken when there was sufficient evidence that total landings (derived from statistics and including "grey" landings as far as they could be traced by the Agricultural Inspection Service) began to exceed the quotas. This also stood in the way of the achievement of the sub-objective: an optimal spread of the landings over the whole year. Later, as the system began to work satisfactorily and landings tended to spread smoothly over the year, the LEI could show that returns had indeed increased. One of the issues that some fishermen complained of was a lack of legal guarantee to fish their IQs when others exceeded their own IQs, which when total landings overshot the quotas, caused for instance, an early closure of the fishery. This obviously induced fishermen to try to dodge the system even more. The only possibility that MAF had to guarantee the IQs was to get all fishermen to fish within their IQs, but until that worked, no guarantee could be provided because MAF was committed to adhering to the national quotas by species agreed on internationally. In principle the IQ system as such was a good way to achieve the main policy objective. Only the control system failed. However after a good control and enforcement system was organised the programme ran smoothly: ITQs are still (25 years later) in force as the basis for an excellent working system, be it that some extra management measures had to be included: first for fishing capacity (HP) and effort (days at sea), then later an integrated co-management system. In principle fishermen generally felt the problems of intensified fishing and were generally not opposed to some sort of catch restrictions. Also, the IQ-management system was reasonably well accepted. However, many fishermen did not fully realise its impact on their own enterprises, for instance, they hoped that the system would affect mostly their colleagues not themselves. When the effects were felt, many fishermen were startled badly by the consequences (see Section 5). After a short time a further source of dissatisfaction for the fishermen was that the government could not guarantee the legal right on each individual IQ (see Section 7.1). However, this feeling was gradually alleviated by the development of the practice of dodging quotas, of "grey" landings, as well as the rather weak hand of the government in opposing these. When controls were tightened, the sector had already found ways to adapt fleet capacity, for a large part, by `flag-hopping' and `quota-hopping' (Davidse 1999), and the remaining fleet generally developed a positive approach to the programme. Unmistakably contributing to this positive feeling were some rather satisfying financial outcomes: fewer vessels sharing the same quotas, a favourable development of fish prices, and falling fuel prices in 1986. `on the basis of quota the banks may grant loans easier'. Negative views included `bad utilisation of quotas', `wrong allocation of the rights' i.e. the continued existence of grievances about distribution of individual quotas in the past, and `no chances for newcomers'. In relation to the problem of the inheritance of fishing units, 22 owners agreed that fishing rights restrained such successions. At the time the IQ system was introduced there were practically no other community groups interested in the change in the method of management, although obviously one related sector, that of fish trade and processing, was interested. But this sector was also represented in the vertically-integrated Dutch Fish Board and could already participate in deliberations and consultations. The trade and processing sector supported the ITQ system, expecting that it would ensure more regular landings. The initial setting of quotas seems to have been satisfactory; in the end the system of ITQs is still working and there is a general feeling that it is a good practice. But one must not forget that in the course of years a lot has happened: the system has been improved and expanded. It must be stressed that each initial allocation of rights will give rise to grudges from several of those involved. After the first allocation round inevitably a process is needed to adjust the rules and make them more effective. And there was the trend to cheat the system that, in the case of the Netherlands, was not well opposed by management. Later, when management did control the landings to a large extent and introduced fleet and effort restrictions, the fleet found ways to adapt the fleet without too much sorrow (see Section 7.2). Ultimately, the introduction of the co-management "group" mechanism contributed much to develop the system. Now it satisfies the policy objectives and is also acceptable to the remaining fleet under the Dutch flag. With the help of other measures such as effort regulation (which lost their meaning gradually after the quota control within the co-management system began to work well), management succeeded in matching fishermen's landings with their quotas. The sector found ways to decrease fleet capacity, for a large part by `flag-hopping'. A co-management system working well was developed - which is generally seen as the major element leading to the programme's success. Naturally problems remain. One is the high price to be paid for the establishment of a new enterprise: vessel(s) plus harvesting rights must be financed. This makes it utterly impossible for newcomers to enter the sector, even the financing of management succession from father to son is difficult. But surely these disadvantages somehow occur in all systems that restrict free or open access fishing in a society where the government basically does not interfere with free competition. Another important issue was that the Dutch fishery was the forerunner in organising an ITQ system within the EC's quota system. Consequently, the industry developed a clear perception of the `ins' and `outs' of such a system, including the value of ITQs, at an early stage. This enabled Dutch fishing enterprises to operate on the property rights markets in other EU Member States (notably the UK, and to a lesser extent Germany, Belgium and France) well before fishermen in those States were conscious of those opportunities. As a consequence, rather extensive `flag-hopping' and `quota-hopping' occured. Enterprises went out fishing on the quota of other States, resulting in fewer vessels sharing the Dutch quota. Davidse W.P., J. De Jager, R. Rijneveld, W. Smit and J.W. De Wilde 1975. De Nederlandse zeevisserij op de drempel van een nieuw tijdvak (Dutch sea fisheries on the threshold of a new era). LEI, Mededeling nr. 127. Davidse W.P., H. Harmsma, M.O. van Wijk, L.V. McEwan, N. Vestegaard, H. Frost 1997. Property rights in fishing. LEI report 159, 1997. Davidse W.P. 2001. The effects of transferable property rights on the fleet capacity and ownership of harvesting rights in the Dutch demersal North Sea fisheries. In: Shotton, R. (Ed.) 2001. Case Studies on the Effects of Transferable Fishing Rights on Fleet Capacity and Concentration of Quota Rights. FAO Fish. Tech. Paper. No 412. Keus B.J. 1991. Juridische aspecten van het EG-visserijbeleid (Legal aspects of the EC fisheries management). LEI, Mededeling nr. 445. Rijneveld R., W. Smit and J.W. De Wilde 1973. Economische perspectieven van de kottervisserij in Nederland (Economic perspectives of demersal fishing in The Netherlands). LEI, Rapport nr. 5.20. Smit W., W.P. Davidse, J. de Jaeger, M.H. Smit, C. Taal, M.O. van Wijk 1995. Visserij in cijfers 1995 (Fisheries in figures 1995). LEI, PR 31-95 and preceding editions. Smit W., A.J. Berg, E. Hoefnagel, R. de Lange, J.A.E. Vervaele, J. de Vries, A.K. Yesilkagit 1996. Bijdrage aan de eindevaluatie van de uitvoering van de voorstellen van de stuurgroep Biesheuvel (Contribution to the final evaluation of the execution of the proposals of the Biesheuvel steering group). LEI, Mededeling 575. Tienstra Th.J., J.H.L. van Lissa, 1980. Vijfentwintig jaar overheidsbeleid ten aanzien van de visserij (Twenty-five years of government management in fisheries). In: Speerpunt voor de Visserij, commemorating 25 years Visserijschap.